Finding Kat Heckenbach: Need a Muse? Stan Marino needs a muse. He's written himself into a corner...again. A shot of inspiration is all he needs to finish his story ...where is he going to find it? What Stan doesn't know: Inspiration has found him. And it's about to take over his life. Ripped from reality, he must lead a band of lost souls in a life-or-death battle with a merciless enemy. Stan has found his muse, but will he survive it? I did this a little differently--the above is the actual back cover blurb. I normally don't use that as an intro to a review because, to be honest, I rarely read back cover blurbs. I've found all too often that the book turns out to be nothing like the back cover description. NOT THE CASE HERE! I also found myself wanting to copy the endorsements for this novel, because I actually agree with them. Descriptions like, "A light-hearted, family-friendly page-turner..." (T.W. Ambrose, editor of Digital Dragon magazine), and "Unique and imaginative, a humorous yet mysterious twist..." (Jill Williamson, author of By Darkness Hid). I found The Muse by Fred Warren funny and heart-warming, with great characterization. I truly enjoyed reading it. I picked it up on a day that I was feeling pretty dumpy, and by the time I had finished it (and I stayed up late to finish it!) I was smiling :). 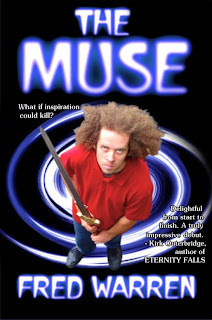 The Muse can be found on Amazon and you can check out the trailer at Splashdown Books. One of my favorite things about the book--Fred Warren's gift for choosing names. Names of places, names of pets...but I'm not going to tell you what they are! If you want to know, you'll have to buy the book ;). I read the book and totally agree with you. And about the names--they're wonderful.